Manjapara Devesa Ramanathan (MDR) was born on May 21, 1923 to Devesa Bhagavathar and Seethalakshmy Ammal in Manjapara in Palghat district of Kerala. He grew up in an atmosphere of divine music, since he was born in a family of musicians. His father Devesa Bhagavathar was a vocalist and violinist. His paternal uncle was a veena vidwan and his grandfather Venkatesa Bhagavathar was also a vocalist. He was initiated into the realms of Carnatic music from his childhood. At the age of four, Kanchi Paramacharya visited his house at Manjapara and was offered "pada pujai" by his parents. MDR recited at that tender age "Bhaja Govindam" and "Margabandhu Sthothram" before the Paramacharya and the Kanchi seer blessed him with a great future in the Carnatic music world. Many years later, when MDR, who had by then become a prominent musician, visited the Paramacharya to seek his blessings, the Seer reminded him about his visit to MDR's house and how he had sung "Bhaja Govindam" and "Margabandhu Sthothram". He gave his first public performance at the age of 9 at the Devi Temple in Pudukode in front of learned musicians and pundits. He pursued his musical education along with academics. He subsequently graduated with an Honours Degree in Physics from Victoria College, Palghat. During his college days, he sang at the Thyagaraja Aradhana and other temple festivals and was much appreciated by many in the musical world. Though his father, looking to the economic plight of Carnatic singers, tried to dissuade him from a musical career and wanted him to take up a more lucrative white collar job, MDR was determined to pursue a musical career, as Carnatic music was his main passion in life, and his every breath was brimming with musical muse. In 1944, he came to Madras and joined KalaKshetra under Rukmini Arundel and Tiger Varadachariar, the doyen of Carnatic music in those days. He was a prime disciple of the great maestro, Tiger Varadachariar. Tiger used to refer to MDR as a "Thirudan" (thief) fondly, for MDR used to be Tiger's shadow for more than 6 years as his disciple, and was so quick to grasp everything that Tiger taught him and also from Tiger's concerts. Tiger used to give recommendation letters to disciples who approached him for recommendations to sabhas. When MDR approached him for a recommendation letter, Tiger told him: "Why do you need a recommendation letter? If you just sing the note "SA", everyone will recognise you as my prime disciple!''. 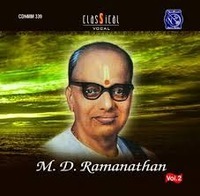 MDR won the first prize in a music competition organised by Mylai Sangeet Sabha in 1947, where his guru Tiger Varadachariar presided and presented him with a "Ramar Pattabishekam" idol. Tiger also gave a speech, lauding MDR's music and told the audience that he, Tiger, was passing on the "Torch of Sampradaya Sangeetam" to this young man and it was up to the music world to recognize his talents and encourage him. MDR adored his guru Tiger and was with him in his final moments when Tiger expired in 1950. Tiger asked him to sing the "Entara" kriti and died with a peaceful expression on his face after he heard MDR singing this kriti. From 1950s MDR started performing in all the leading sabhas and quickly rose to the forefront of musicians. e became a lecturer at Kalakshetra and was instrumental in carrying on the glorious "sampradaya sangeetam" tradition of Tiger in that institution. Though he was offered many prestigious positions in other musical institutions, he refused all those, since he was devoted to Kalakshetra, his Guru's institution, and was also very close to its founder Smt. Rukmini Arundel. Kerala Sangeet Natak Academy Award in 1964. He was blessed and honoured by leading seers like the Shankaracharyas of Kanchi and Sringeri and the Jeer Swamigal and was also patronised by the Royal family of Travancore. He was very close to Kanchi Paramacharya, who loved to hear him sing "Gurulekha" in "Gowrimanohari". He survived a heart attack in 1972 after a memorable concert at Rasika Ranjani Sabha, and was asked by his doctors to give up singing. But he rejected this advice, and continued to give concerts till his demise on April 27, 1984. He was a great devotee of Lord Rama, and was very well versed in all aspects of Hindu religion, spirituality, mythology, various temples and their traditions and the relationship of great saint singers to these temples, as reflected in their compositions. His greatest regret was that in the final few months of his life, he was not in a physical condition to sing even a few krithis on Lord Rama on special occasions like Bakula Panchami and Ram Navami. MDR was a scholar in Tamil, Malayalam, Telugu, Sanskrit and English. He composed over 300 krithis and musical operas like "Varada Bhakta Vijayam", "Sundara Ramayanam" and a Kalakshetra musical ballet "Buddha Avatharam". He led a highly principled life, refusing to run after awards and titles, though some of them, came to him naturally for his contribution to preserving our musical traditions. His only mission in life was to propogate his guru Tiger's musical traditions to future generations and in this, by all standards, he succeeded immensely. Admirable vilamba kala spacing, pure and richly intoned exposition of the raga in manthra sthayee and, even in anumathra sthayee, leisurely delineation of the ragas and sangathis, strict adherence to the realm of his guru Tiger's "sampradaya bani", classical phrasing and imaginative swarams and, above all, great "Bhavam" in all his singing, bringing out the core of "bhakti" as contained in the great trinity's compositions marked his music.